Update – November 19, 2015: Swiss Re Integrates the SIAI-Marchetti S211 jet upset training platform into its UPRT solutions with APS and CAE. New York City, 21 October 2013 – Swiss Re Corporate Solutions signs an agreement with prominent aviation flight simulation and training companies, CAE and Aviation Performance Solutions (APS). The agreement allows General Aviation clients based in North America to increase aviation safety through a combination of an advanced training program and financial incentives embedded into the insurance purchase. The program will be rolled out globally in 2014. 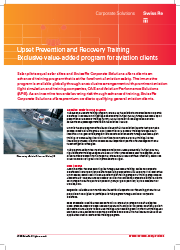 The advanced training program, addressing loss of control in-flight, has been developed by APS, a world leader in upset prevention and recovery training (UPRT), and CAE, a leading provider of full-flight simulation training. Both companies have been collaborating to provide UPRT for business and commercial aircraft pilots. Loss of control in-flight refers to incidents outside of the normal flight procedures that lead to an inability of the pilot to regain control of the aircraft. 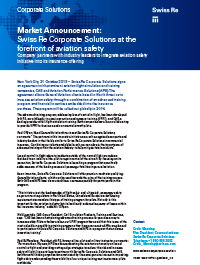 By focusing on its prevention, Swiss Re Corporate Solutions is launching a program that specifically addresses one of the leading causes of passenger fatalities in general aviation. As an incentive, Swiss Re Corporate Solutions will offer premium credits to qualifying General Aviation clients, which can be used towards the price of the training courses. Both CAE and APS have discounted these courses especially for participants in this program. “This initiative is at the leading edge of flight safety and, ultimately, passenger safety as government regulators in the United States, Canada and Europe are developing requirements to mandate this type of training program for pilots. Not only is this important for the aviation industry but it also directly reduces frequency of losses within the insurance industry,” adds Mr. O’Ryan. Swiss Re Corporate Solutions offers innovative, high-quality insurance capacity to midsized and large multinational corporations across the globe. Our offerings range from standard risk transfer covers and multi -line programmes, to highly customised solutions tailored to the needs of our clients. Swiss Re Corporate Solutions serves customers from over 40 offices worldwide and is backed by the financial strength of the Swiss Re Group. For more information about Swiss Re Corporate Solutions, please visit www.swissre.com/corporatesolutions or follow us on Twitter @SwissRe_CS. CAE is a global leader in modelling, simulation and training for civil aviation and defense. The company employs approximately 8,000 people at more than 100 sites and training locations in approximately 30 countries. CAE offers civil aviation, military and helicopter training services in more than 45 locations worldwide and trains approximately 100,000 crew members yearly. The company applies simulation expertise and operational experience to help customers enhance safety, improve efficiency, maintain readiness and solve challenging problems. More information can be found at www.cae.com. Follow CAE on Twitter @CAE_Inc.